We went for a bike ride down to the park this evening -- trying to enjoy the weather before we hit our first 90 degree day for July (should happen tomorrow). 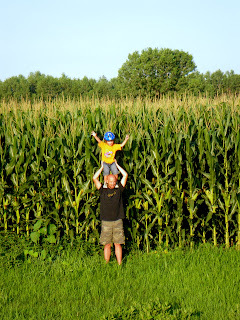 We think this is the tallest we've seen the corn in the fields in 10yrs we've lived here. Looks photoshopped to me. Either that or Pete got shorter as he became skinny. Funny Dave -- I looked at the pic again and it SO looks PS'd. They look like Oompah-loompas ! But I swear it is real.. no photo shopping on this one. Wow I have never seen such corn.